Wash chicken pieces and pat dry. Place in a large dish. To prepare Marinade, mix allm arinade ingredients together in a bowl. Pour the mixture over the chicken pieces and mix until all pieces are well coated with marinade. Cover and refrigerate for 2 to 3 hours. 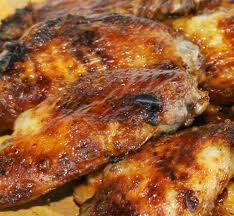 Barbecue chicken pieces over glowing coals, or BBQ, until golden brown all over and cooked through.